With A PARLIAMENT OF BODIEScoming out in just a few weeks, I think it's appropriate to look a bit at the backlist and what's led up to this book. Primarily, the first two books of the Maradaine Constabularyseries. Blending high fantasy, murder mystery and gritty urban magic, this series features Inspectors Satrine Rainey and Minox Welling, two detectives in the city constabulary who protect Maradaine from crime, both magical and mundane. Satrine Rainey: Former street rat. Ex-spy. Wife and mother who needs to make twenty crowns a week to support her daughters and infirm husband. To earn that, she forges credentials and fakes her way into a posting as a constabulary Inspector. Minox Welling: Brilliant Inspector. Uncircled Mage. Outcast of the stationhouse. Partnered with Satrine because no one else will work with “the jinx". 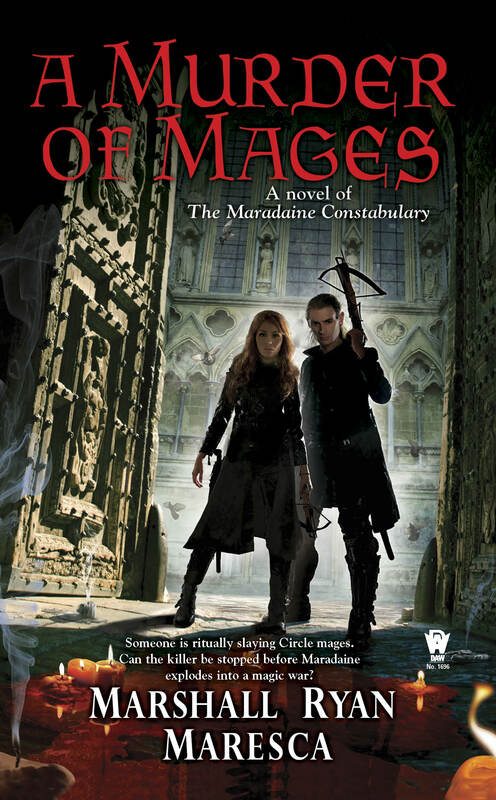 Their first case together—the ritualized murder of a Circled mage—brings Satrine back to the streets she grew up on, and forces Minox to confront the politics of mage circles he’s avoided. As more mages are found dead, Satrine must solve the crime before her secrets catch up with her, and before her partner ends up a target. 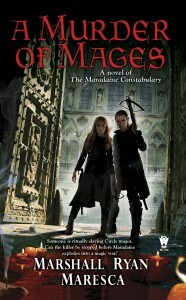 READ AN EXCERPTGoodreads Pagefor A MURDER OF MAGESAvailable at Amazon, Barnes & Noble, IndieBoundand more! The neighborhood of the Little East is a collision of cultures, languages, and traditions, hidden away in the city of Maradaine. A set of streets to be avoided or ignored. 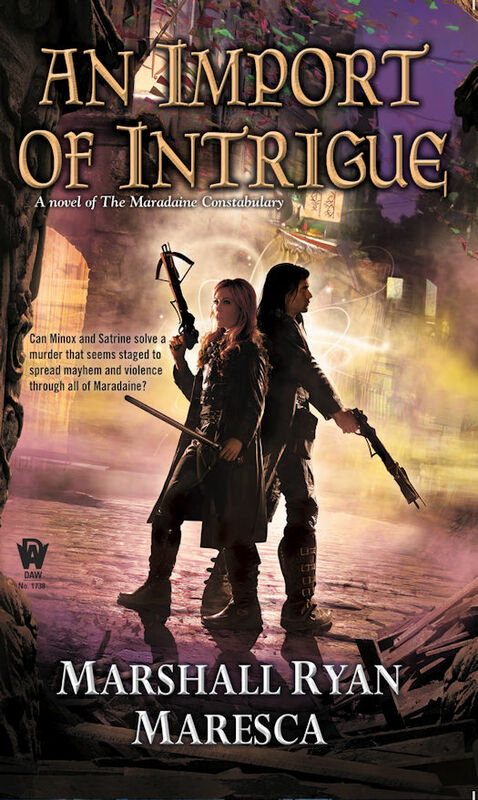 When a foreign dignitary is murdered, solving the crime falls to the most unpopular inspectors in the Maradaine Constabulary: exposed fraud Satrine Rainey, and uncircled mage Minox Welling. With a murder scene deliberately constructed to point blame toward the Little East, Rainey is forced to confront her former life, while Welling’s ignorance of his own power threatens to consume him. And these few city blocks threaten to erupt into citywide war unless the constabulary solves the case. Available at Amazon, Barnes & Noble, IndieBoundand more! But it would be remiss to leave out novels in the other series that lead up to this one as well! 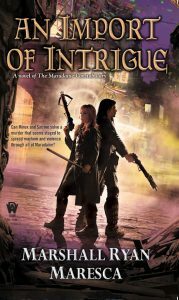 The Imposters of Aventil features Satrine and Minox as they investigate the murder of a constable and the Thorn's involvement, and the events of that book echo into Parliament. Also, as the inspectors team up with Dayne Heldrin of the Tarian Order, it wouldn't hurt to check out The Way Of The Shieldas well. And there may be threads to Streets of Maradaine. It wouldn't hurt to read them all. I mean, just to be safe. 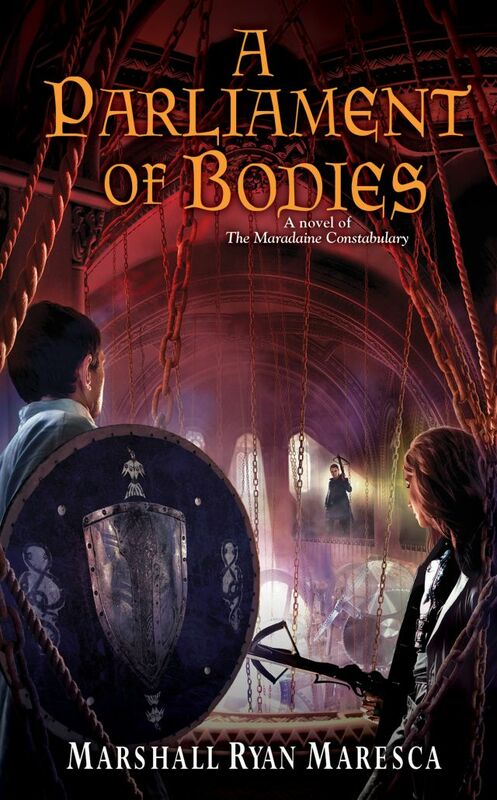 We're just six weeks away from the release of A PARLIAMENT OF BODIES, which I'm so excited to get into your hands. I know people have been anxious for more of Satrine and Minox, PLUS you get more of Dayne and Jerinne. (You have checked out WAY OF THE SHIELD already, yes?) Well, even if you haven't, PARLIAMENT gives you a great introduction to them. Publishers' Weekly says, of PARLIAMENT, "Maresca’s detailed worldbuilding and tightly plotted intrigue will entertain fans of suspenseful fantasy." Do we really need all of these reboots? Does the current reboot formula work for everything? And do all these retellings steal energies (and audiences) from new creations? Our participants discuss the good and bad of the reboots we love to hate. What's the greatest stuff you saw last year? Let’s (quickly) review and recommend 2018's best movies, TV shows, theatrical productions, and more in the worlds of science fiction, fantasy, and horror. If you're eligible to vote, feel free to take notes — your Hugo Awards nominations ballot is due in Dublin, Ireland soon. Who knows better than a horror writer how to survive a horror story? Join he fun and "lively" conversation as our panelists discuss scenarios from horror novels and films as if they themselves were characters within the scenes. Will their special authorial insights keep them safe? Will they split up to look for the cat? What are they willing to do to survive (relatively) intact? Who dies first? Who lives to tell the tale? Also, I will be at the Sunset Valley Barnes & Noble on TUESDAY, MARCH 26th (Release day!) at 7pm for a reading and signing event. If you're in the greater Austin area, please come on out! 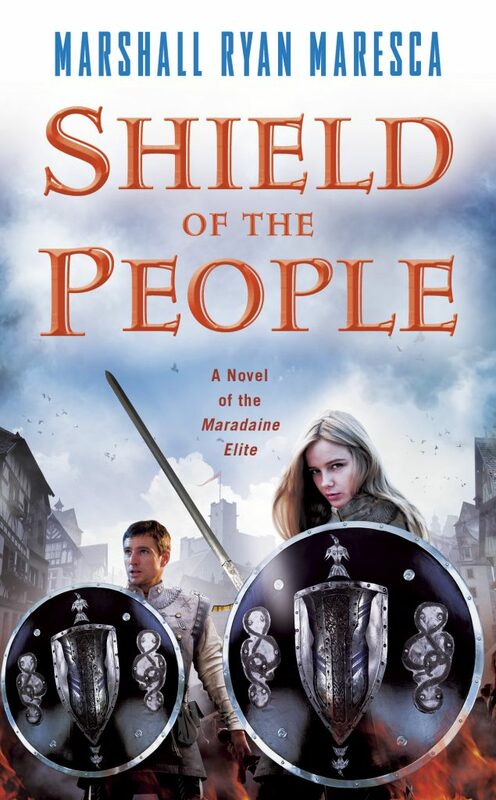 I'm very excited that I finallyget to share the cover of the second Maradaine Elite novel, SHIELD OF THE PEOPLE. It's a gorgeous cover that highlights both Dayne and everyone's favorite Tarian Initiate, Jerinne Fendall. Not only do we have a cover, but description and pre-order links! Go now so you can have it in your hands when it comes out on October 29th. The second novel in the Maradaine Elite series blends fast-paced high fantasy and political intrigue, where Dayne and his compatriots get embroiled in a plot of dissident groups threatening to disrupt Parliamentary elections and throw Maradaine into chaos. After stopping Tharek Pell and saving the Druth Parliament, Dayne Heldrin and Jerinne Fendall find themselves on the margins of the Tarian Order: lauded as heroes in public but scorned and ignored in private, their future in the Order hazy. Dayne is given an assignment that isolates him from the Order, and Jerinne is hazed and bullied at the bottom of the initiate rankings. But it’s a grand holiday week in the city of Maradaine, celebrating over two centuries of freedom and the foundation of the reunified modern nation, and with that comes parades, revelry… and protests and demonstrations. A dissident group called The Open Hand–and their mysterious, charismatic leader, Bishop Ret Issendel–seeks to disrupt the Parliament elections with their message of secession and dissolution. Despite orders to stay out of the public eye, Dayne and Jerinne are drawn into the intrigue of the Open Hand and kept apart by dark powerful conspiracies that brew around them. Dayne and Jerinne must fight for their own principles, and protect the will of the people as the election is thrown into chaos. Available at Amazon, Barnes & Noble, IndieBound and more! So, whenever that question pops up, I can't help but think of Jimmy Rabbit, trying vainly to hold auditions for the Hardest Working Soul Band in Dublin. It's funny, because when I think about the books that influenced me, I'm kind of at a loss. I mean, nothing that I read in my youth really matches what I write. I cite Zilpha Keatly Snyder and David Eddings as influences, and it's true. They both opened my idea of what fantasy could be, and more specifically what it didn't have to be. That was important, because on some level I was always dissatisfied with the trappings of 'traditional' fantasy. Even though Eddings fits in that category, it did it in a way that defied my earlier expectations. Both Green-Sky and The Belgariad showed me that Fantasy didn't have to fit neatly into the genre boxes. And of course, there's Watership Down, which is more myfantasy epic than any others. That book showed me a thousand different ways to make a different culture, different world, feel both comfortable and familiar while being alien and strange. It's just a gorgeous work. Then there's the stuff outside of the genre boxes, which shaped how I looked at storytelling and world building. Something like, say, Jared Diamond's Guns, Germs and Steel was a huge influence on the way I looked at how societies grow and advance, and thus how world building works. I'm thrilled that nowadays there is such a wealth of fantasy nowadays that doesn't fit neatly into the boxes. The stuff that's proliferating today is exactly the sort of thing I craved back in the day. And I'm glad to be a part of that. Because the stuff I'm writing is, to a large degree, the sort of thing I wanted to read back then. Hopefully that will influence some writer of tomorrow.